Years ago, when I lived in Eugene, Oregon, I would frequent a food cart — the Cart de Frisco — that made tasty grilled-chicken sandwiches. Here's my own version, based on memory. 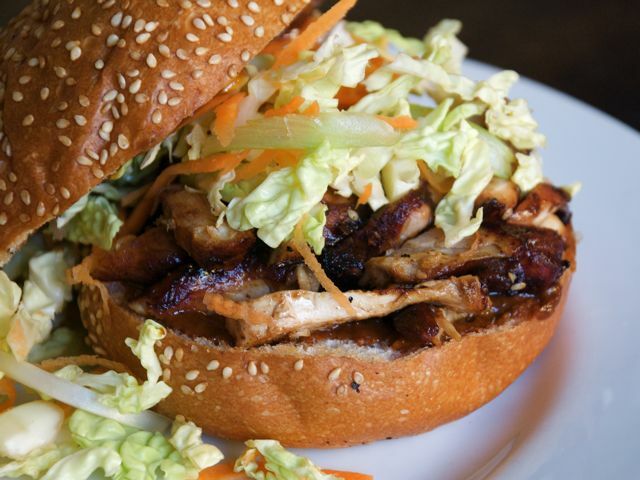 I'm not sure how far it strays from the original, but it combines what I consider the essential flavors and textures: squishy toasted bun, grilled chicken, veggie slaw, and spicy peanut and sweet hoisin sauces. Prep the marinade and chicken: Combine all the marinade ingredients in a 8-inch-by-8-inch baking dish and whisk until smooth. Add the chicken, turning over to coat both sides, and marinate in the refrigerator for 1 to 2 hours. Prep the sauce: In a small bowl, combine all the sauce ingredients and whisk until smooth. If the sauce seems too thick, add another tablespoon of hot water and whisk until smooth and the consistency of thick cream. Set aside. Prep the slaw: In a medium bowl, combine the cabbage, carrot, and green onions; toss until combined. Cook the chicken and prep the buns: After the chicken has marinated for at least an hour, grill until cooked through. Allow to rest for 5 minutes, then chop or slice into 1-inch chunks. Meanwhile, toast the buns. Assemble the sandwiches: On the inside of one bun half, spread about 1 tablespoon of hoisin sauce; on the inside of the other bun half, spread a spoonful of peanut sauce. Divide the chicken and slaw between the four sandwiches. Serve extra peanut and hoisin sauce on the side.